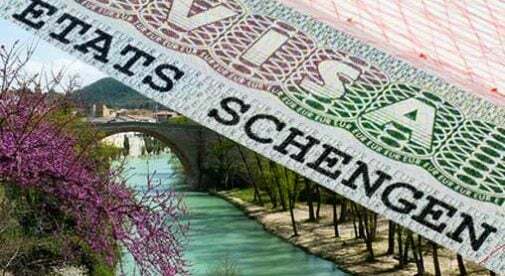 Schengen Visa: What Countries are in the Zone and How Long Can You Stay? Schengen Visa: What Countries Are in the Zone? Lots of Europhiles dream of taking six months or a year to explore Europe…traveling from country to country…staying put for a while (maybe even renting an apartment or villa for a month or two) and getting to know a region…then moving on to the next enticing destination…. What Is the Schengen Zone? Most of mainland Europe—26 countries, at present—belongs to the so-called Schengen Zone. The Schengen Zone has a uniform visa policy, and it has abolished passport controls and most other border controls within the Zone. Your passport will be checked—possibly quite carefully—when you first enter the Zone via a member country. But once you enter the Schengen Zone, your passport normally won’t be checked again until you leave the Zone. So for most practical purposes, you’ll treat the Zone as though it were a single country. Non-Europeans can visit countries within the Schengen Zone as tourists for only limited amounts of time. For citizens of the U.S., Canada, Australia, New Zealand, and many other countries, that limit is 90 days out of every 180 days. That 90-day limit holds for the entire Schengen Zone. So, let’s say you want to visit France and Italy, both of which belong to the Schengen Zone. You can spend up to 90 days either in France or in Italy…or you can divide your 90 days between the two. But you don’t get 90 days in each. What Countries Belong to the Schengen Zone? Current member countries of the Schengen Zone are the following: Austria, Belgium, the Czech Republic, Denmark, Estonia, Finland, France, Germany, Greece, Hungary, Iceland, Italy, Latvia, Liechtenstein, Lithuania, Luxembourg, Malta, the Netherlands, Norway, Poland, Portugal, Slovakia, Slovenia, Spain, Sweden, and Switzerland. In addition, three European microstates—Monaco, San Marino, and Vatican City—effectively operate as part of the Zone, even though they aren’t members. You’ll notice that many countries in the Schengen Zone are also part of the European Union…but not all of them. There is a great deal of overlap—but the Schengen Zone and the EU are not the same thing. As mentioned earlier, you can stay in the Schengen Zone for 90 days out of every 180-day period. Note that 90 days is not the same as three months. If you enter and leave the Zone frequently, keeping track of your days can be difficult. Fortunately, you can find apps online that can help calculate the days for you. See: https://ec.europa.eu/assets/home/visa-calculator/calculator.htm and http://adambard.github.io/schengencalc/ as examples. One tip: Make sure that passport control stamps your passport every time you enter or leave the Zone. If it doesn’t, you have no way to prove how many days you’ve stayed. Citizens of many countries, including the U.S. and Canada, don’t need a visa to enter the Schengen Zone for short stays. You simply show your passport on arrival in a Schengen country and are allowed entry for 90 days. As you can see, planning a long-term stay in Europe requires some fancy footwork to stay within the Schengen guidelines. But there are two main ways to do it. After spending 90 days in the Schengen Zone, stay in a country outside the Zone for the remaining 90 days of the 180-day period. You can then return to a Schengen-Zone country for a further 90 days. There are several nearby countries to choose from that are outside the Schengen Zone. In these countries you can pleasantly wait out the rest of your 180-day period. First, of course, are the four EU countries that haven’t yet joined the Zone: Bulgaria, Croatia, Cyprus, and Romania. There is Albania, which is not yet a member of the EU. And there are Ireland and the UK, which are members of the EU (for now, at least, in the case of the UK) but are not part of the Schengen Zone. Hopping in and out of the Schengen Zone for 90-day periods is certainly feasible for a year or so. After that, you may find it wearing. But it does let you “try out” Europe with no strings attached—you’re simply a tourist. In the long run, you may decide you want to be a part-time expat, spending part of the year in Europe and the rest of it back home. Alternatively, you may decide to seek residence in a European country. Which brings us to the second option for long-term stays…. Get a residence visa for a European country (even a Schengen-Zone country, if you like). You can then stay in that country for the duration of your residence visa. (This is usually a year.) The 90-day limit will continue to hold for all other Schengen-Zone countries…but you may find that limit more manageable when you actually live in Europe. Unlike the requirements for tourist visas, which are uniform across the Schengen Zone, requirements for residence visas are set by each individual country. Most countries offer at least one visa based on your showing economic self-sufficiency: that is, that you can support yourself (and any dependents) financially in the country without working. The amount of income required varies by country and in some cases by city/region within a country. You’ll also need to show that you have private health insurance valid in Europe. (This is true even if you are allowed to join a country’s nationalized health system after you get your visa.) And you often will be asked to produce a police report from the place(s) where you lived previously. Contact the consulate or embassy of the country that interests you for further details and requirements. Finally, can you simply overstay your time limit in the Schengen Zone? After all, your passport is only checked and stamped when you enter and leave the Zone…. Yes, it’s possible—but it’s not advisable. First, recent terrorist-related incidents in Europe have heightened security; some countries temporarily reinstate border controls—so a spot check of your passport is always possible. And second, if you are interested in visiting Europe regularly, you don’t want a black mark against your name for having overstayed your welcome. You may be allowed to do so once…but authorities may be less forgiving a second time—and could deny you entry thereafter. So if you want Europe to be part of your life regularly…stay within the rules.